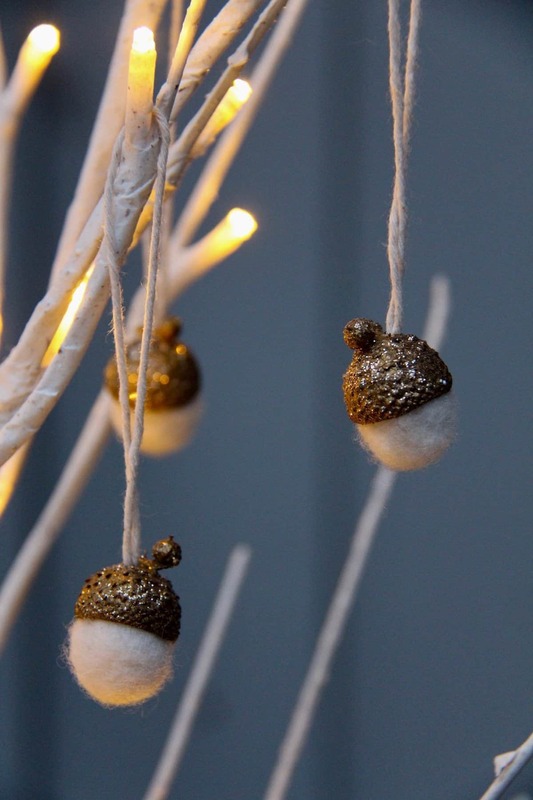 Felted acorn Christmas ornaments are absolutely adorable! 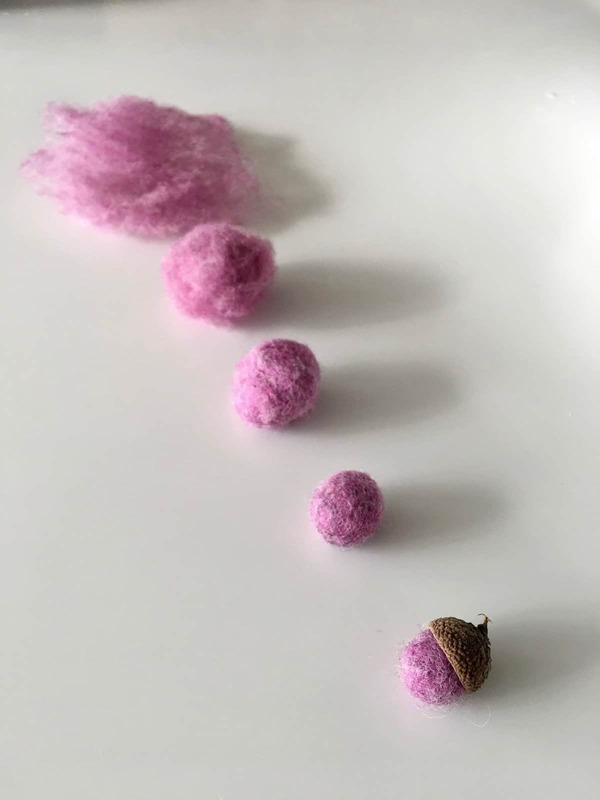 These cute little felted acorns are actually super easy to make. 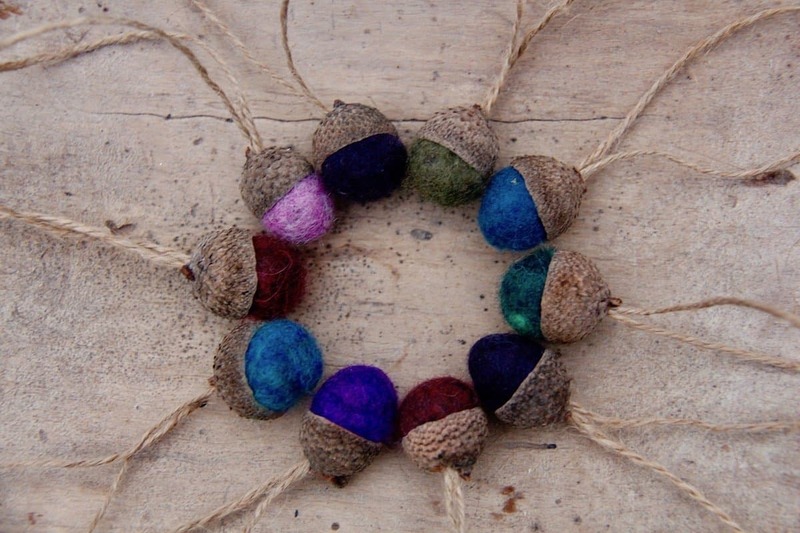 Hang each acorn on it’s own string or put them together to create a garland. 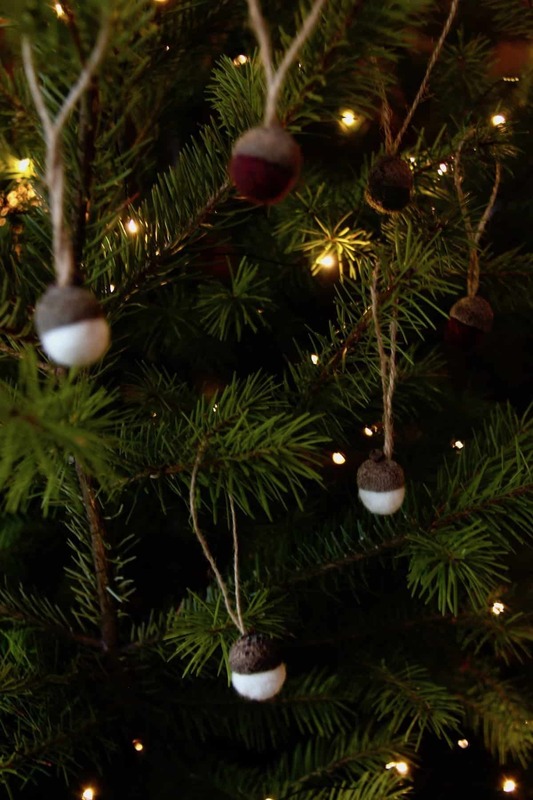 Here’s exactly how to make felted acorn Christmas ornaments. 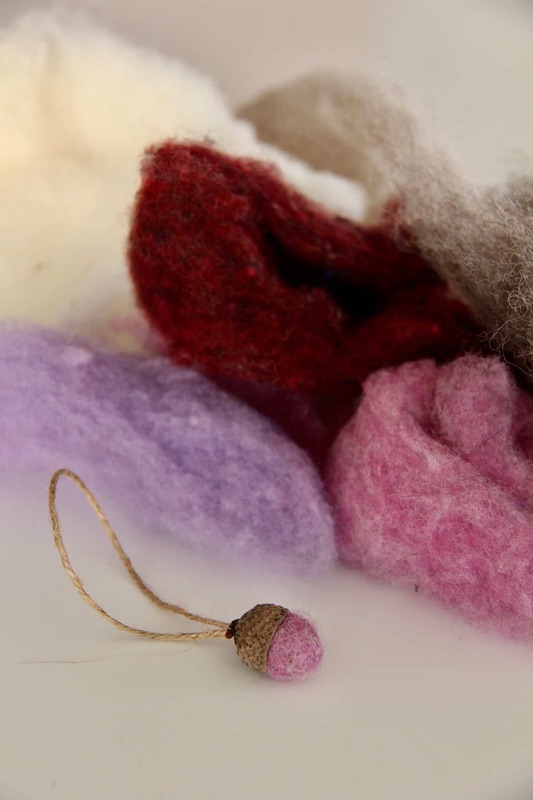 Felted acorn Christmas ornaments are created through the wet felting process. This process involves using hot, soapy water to bind wool fibres together. If you’ve ever accidentally shrunk a wool sweater in the wash, you’ll know how easily wool can felt together in hot, soapy water. I first heard of this process over at Hermit & Co., who posted the most beautiful ornaments a few years ago. I did make similar acorns last year using needle felting, but this year I was determined to make them using wet-felting. Fortunately my friend Rebekah from local textile co. Grain Handmade showed me how! 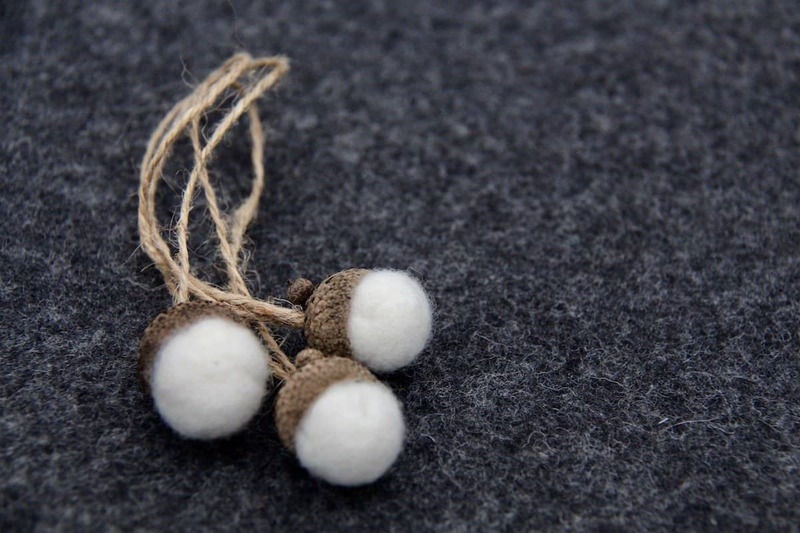 The wet felted acorns are more dense and more uniformly shaped than needle felted acorns. They do take a bit longer, but they’re totally worth it (plus no sharp needle required!). 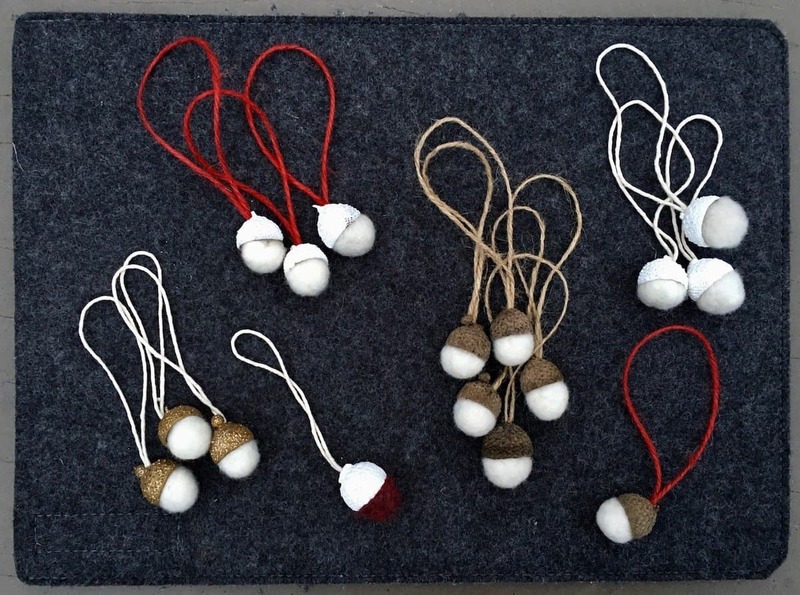 Here’s the supplies you’ll need to make the felted acorn Christmas ornaments. 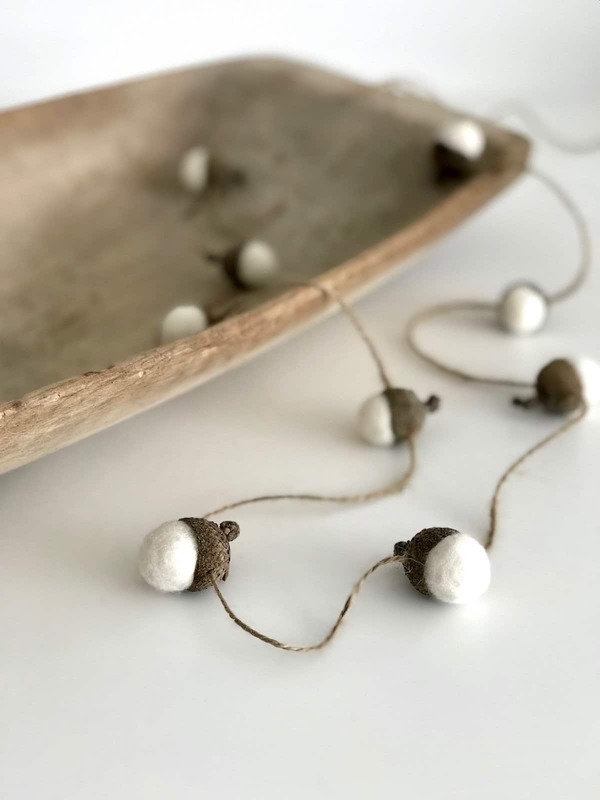 This includes the supplies for making the felted acorns themselves as well as the supplies for creating the ornament hanging loop. Use the drill bit that corresponds to the thickness of your twine. If you’re putting twine through the hole twice to form a loop, the hole will need to be larger. 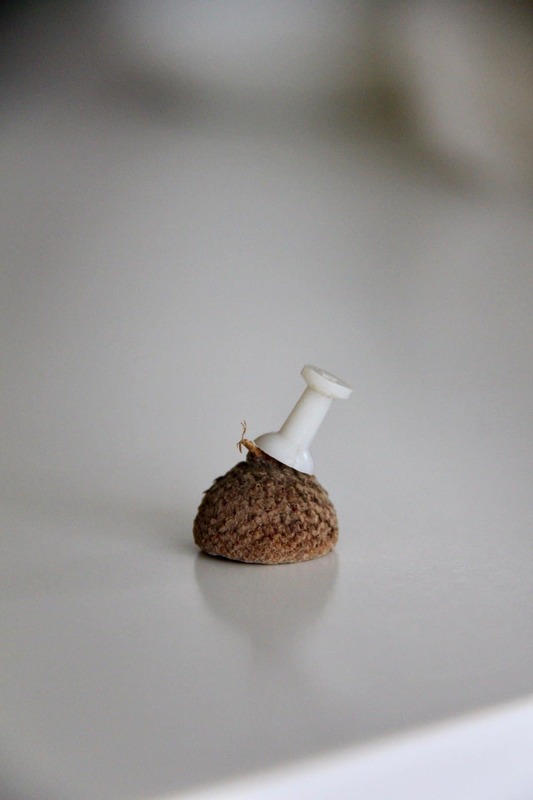 If you don’t have a drill press, you can use a thumb tack to poke holes in the acorn caps. Collect acorn caps. The acorns will come out of the caps more easily once they start to turn brown and dry out in the fall. Save a couple acorns for size reference. If you want to be sure that the caps are bug/pest-free, you can wash them and then bake them in a low temperature oven. The caps can also be painted with a sealant if you prefer. Use a drill press (or drill, or thumbtack) to drill small holes in the caps. If you don’t know how to safely use the tool you’ve got access to, ask someone who’s handy with tools to teach you. Take a piece of the twine with you to test out the size of the hole on the first drilled cap. 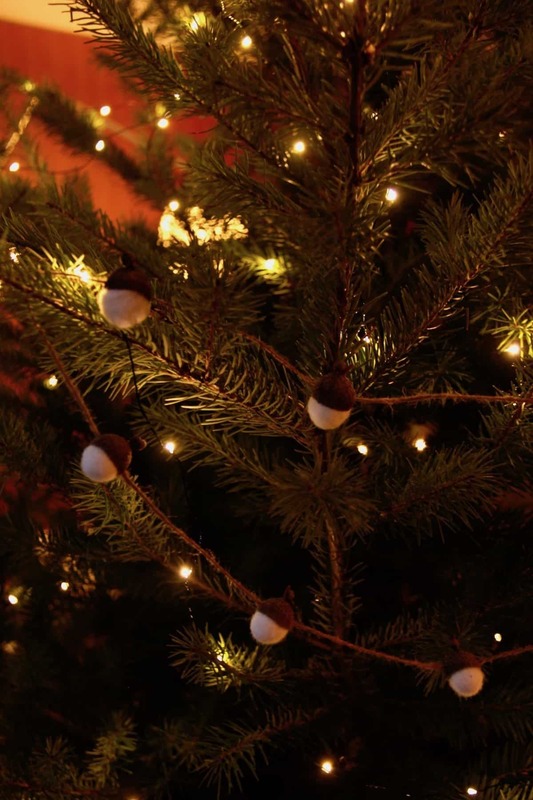 For single hanging ornaments, drill one hole in the top of the cap. To create a garland, drill two holes in the side of each cap (opposite one another). If you’d like to paint and/or glitter the acorn caps, now is the time. Try not to seal up the newly-drilled hole with paint. You could also paint/glitter the caps before you drill, but the drilling process may scratch the paint (particularly around the hole). 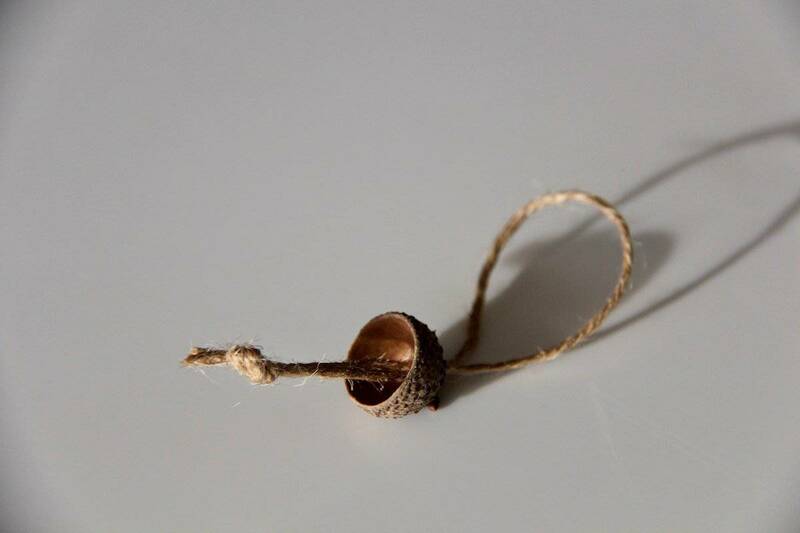 Pull a piece of twine through the cap. Use an embroidery needle to thread the twine if it’s tricky to get the twine into the hole. 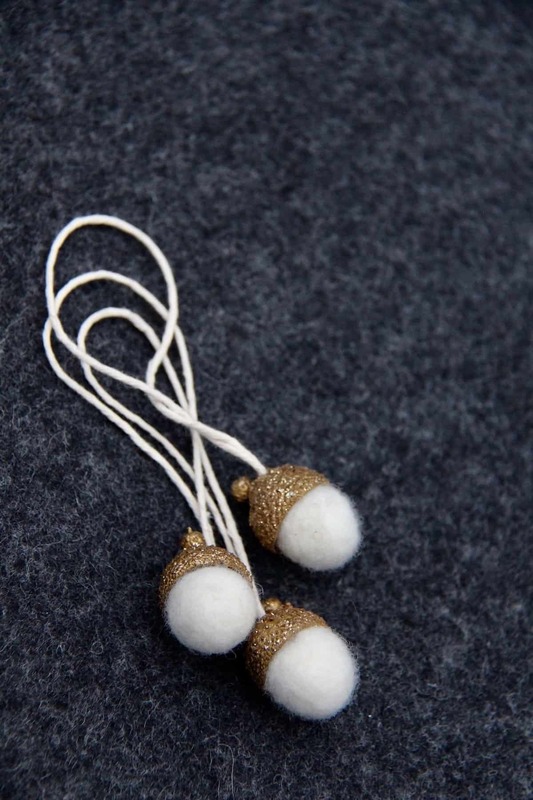 For single ornaments, tie a knot inside the cap to secure the loop of twine (see photo above). 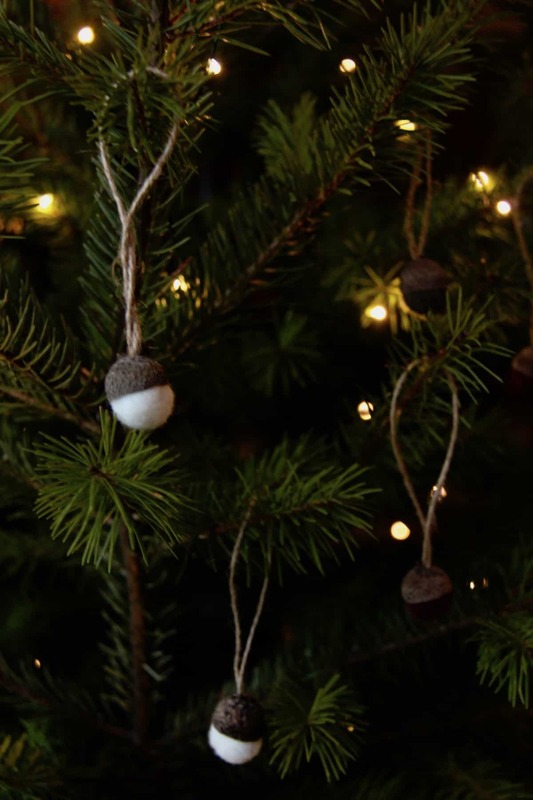 For garlands, you may wish to thread the twine later, through the finished acorns, using an embroidery needle. The stages of wet felting. The loose ball at the top becomes the tiny acorn after a few minutes of wet felting. Separate out a small piece of roving to make the first acorn. Fan the roving out so it’s loose (see photo below for example). Gently roll the roving around into a rough sphere shape. This will start to create the acorn shape and also allow you to test for size (and amount of wool). Try to make the sphere as uniform as possible (few cracks/lumps). The loose rolled ball should be about twice as big as the real acorn. 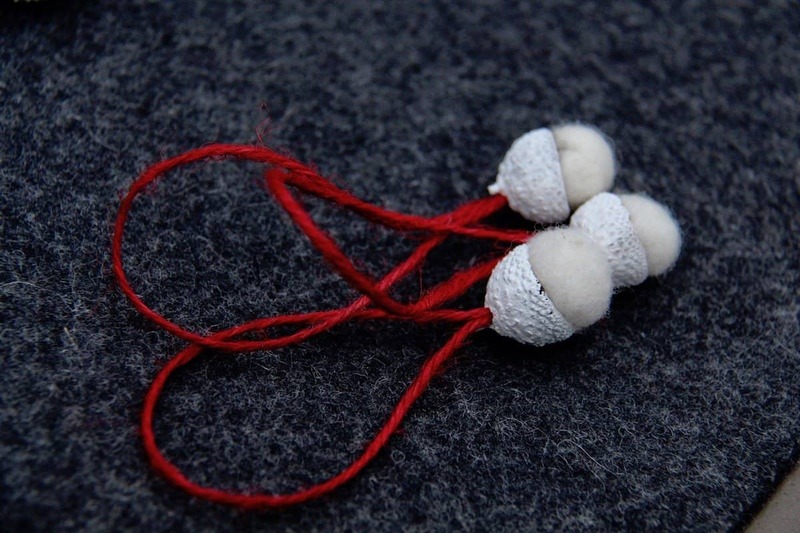 The felting process will cause it to become more dense and shrink in size. If you’re having trouble rolling the roving, try winding it around your finger first. Fill one bowl with hot water and add a few drops of dish soap. Fill the other bowl with cold water. 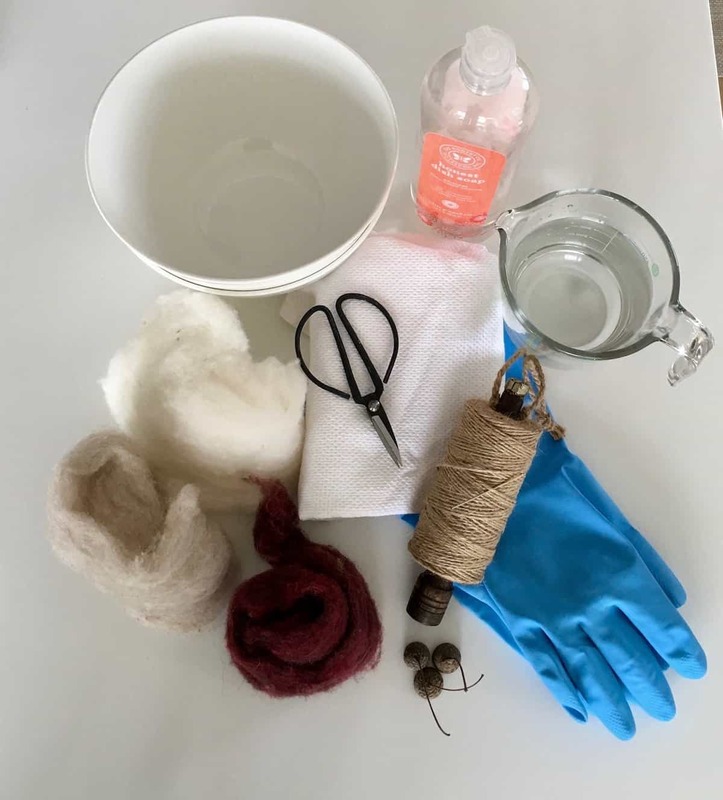 Dip the rolled wool roving into the hot soapy water using the rubber gloves. 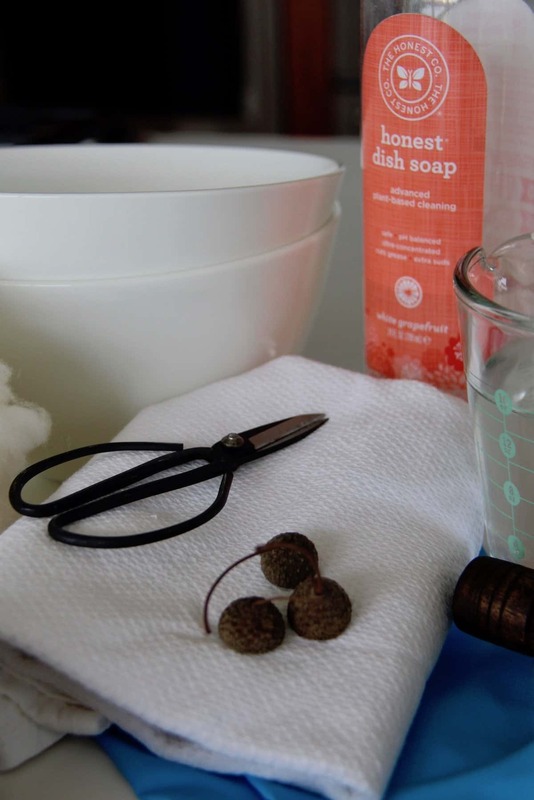 Using the rubber gloves, gently roll the acorns around between your palms in the hot soapy water. The texture on the palm of the rubber gloves will help the fibres to bind together into a tight ball. 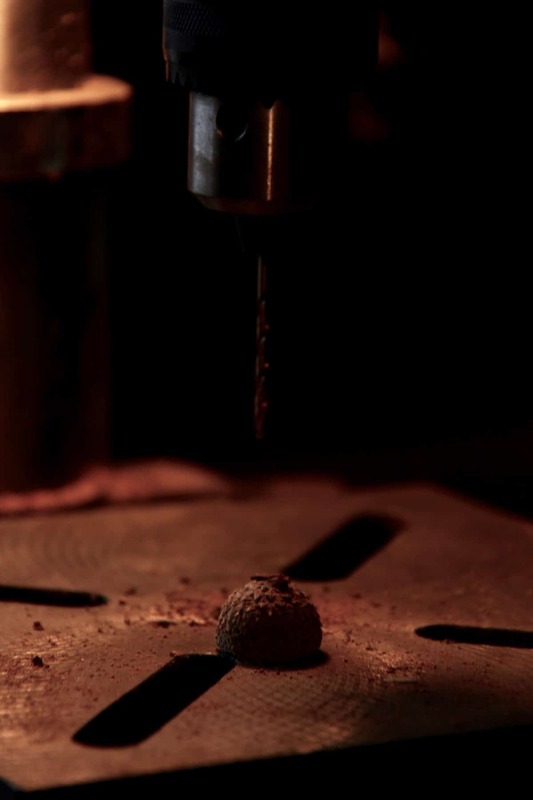 Slow and methodical rolling will produce the most uniform, smooth spheres. Try not to “smash” the ball as this will create lines. If you do get a line, cover it with a little wisp of loose roving and work in the extra roving. Alternatively you can hide the line later inside the acorn cap if it’s small. This can take a while. It’s a bit of a meditation. If you find that you don’t like this step, you can speed it up by pre-felting the acorns using a needle-felting technique. 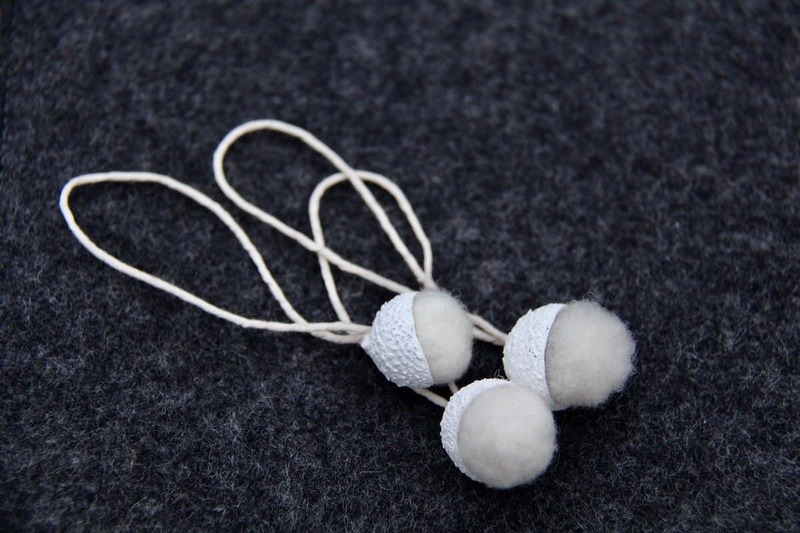 Or, you can just wet-felt the balls a bit by hand and then tie them one-by-one into an old piece of pantyhose. Toss the hose of wool balls into the washing machine and let it do the work! The wool ball should have become more dense with all of the hand felting in the hot water. Once it’s feeling like it will stay formed together, dip the ball in the cold water. This will shock it a bit and wash out some of the soap. Keep rolling. Place the wet-felted acorn onto the drying rack. 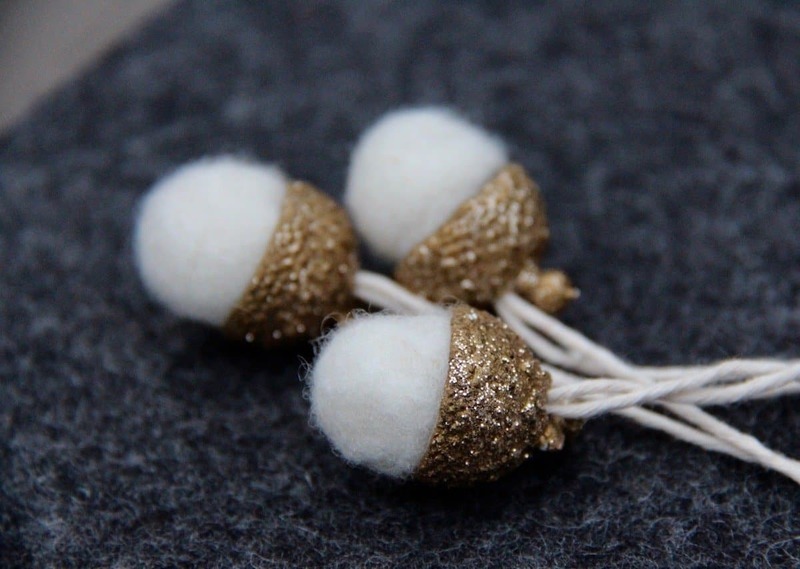 Repeat the wet-felting process for the rest of your felted acorns. Once all the wool acorns have had a minute or two to start drying, roll each one of the acorns one last time between your palms to create the densest wool balls. Allow the finished wool felted acorns to dry overnight. 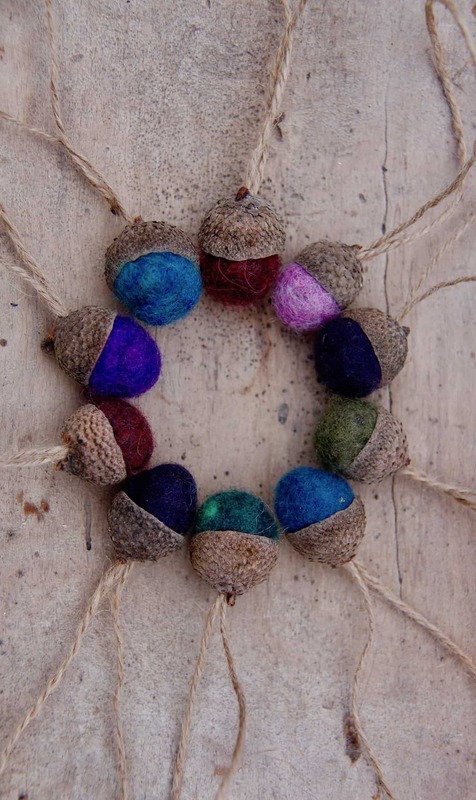 Match the dry felted acorns up with the acorn caps. Test out the felted acorns in different caps to find caps that fit the finished wool acorn shape. 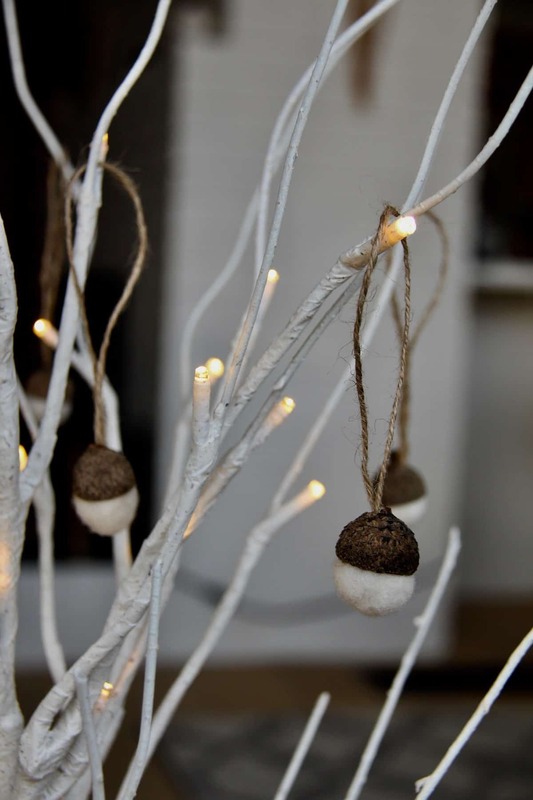 Glue each acorn into a cap to create the finished acorn Christmas ornaments! 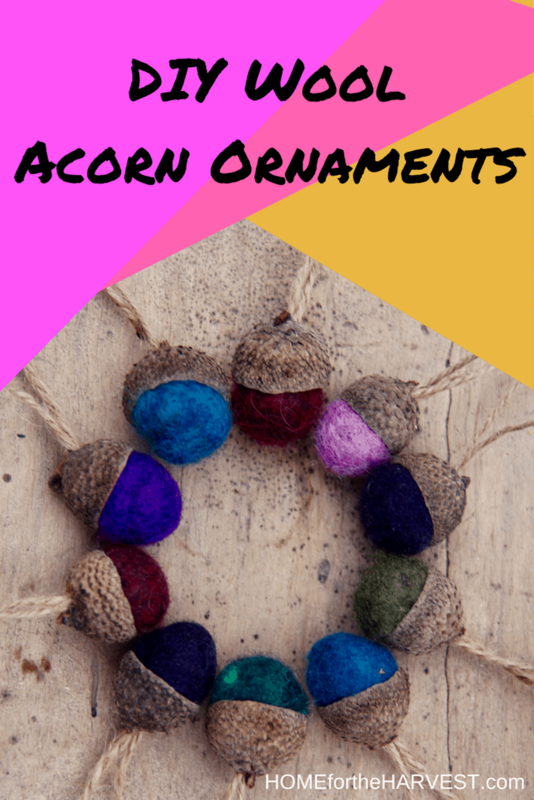 I hope you enjoy making your own felted acorn Christmas ornaments! 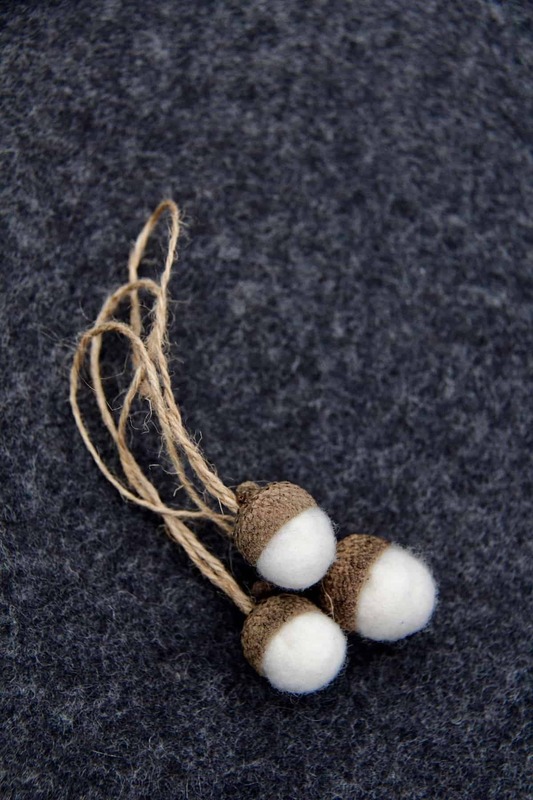 These felted acorns are fairly simple to make and are super cute! 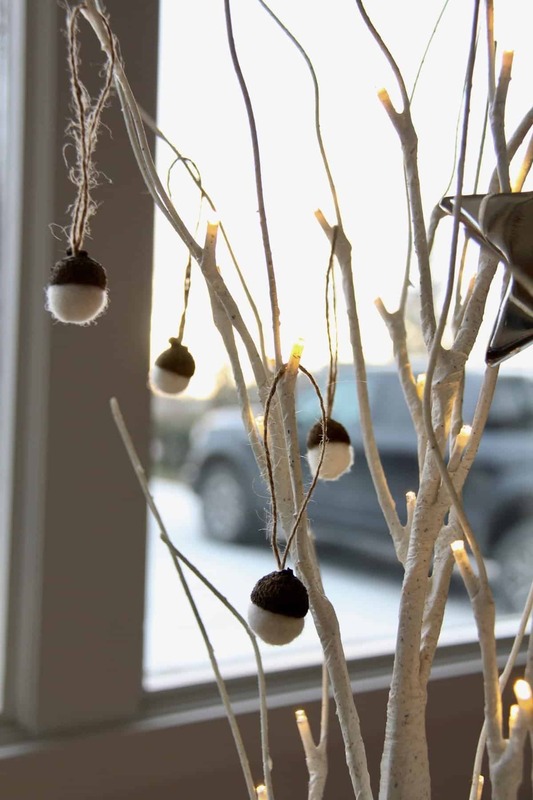 Want to save these felted acorn Christmas ornaments for later? Pin it! If you’re not into making your own felted acorns, you can buy both felted acorn ornaments and wool acorn garlands on Etsy. They’re handmade and available in a ton of different colours! 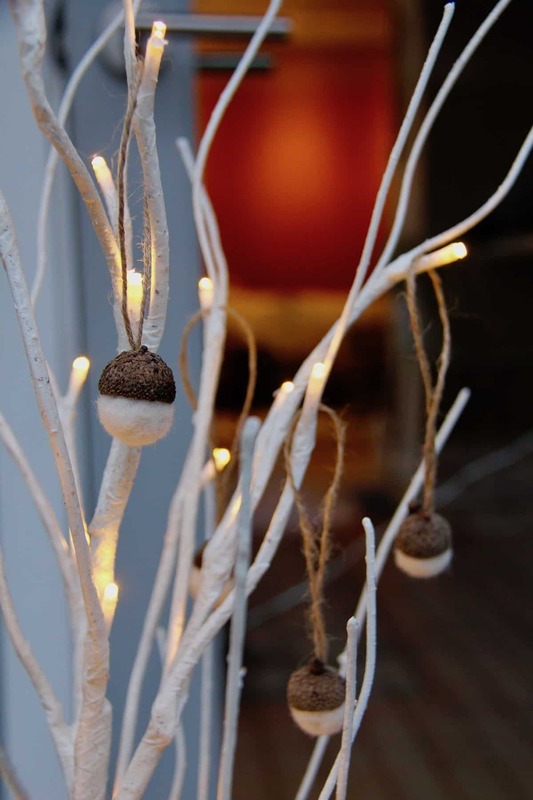 Also check out these other natural Christmas decoration ideas (the birch bead wreath ornaments are super easy! ).